War is hell. War is also peace. Hate is hate, but hate is also love. Forced to sit tgether on a cross-country trek, love, hate, war, and peace all coagulate in order to form some kind of nihilistic overture. And yet although Checkpoint claims that it is a book about one of the most pressing issues our time, it ultimately ends like G. K. Chesterton’s The Man Who Was Thursday—with a sort of anarchic lightness blending with the gray fog of life. Written by one of the founders of Doctors Without Borders, Checkpoint recounts a grueling drive from Lyon to the battlegrounds of central Bosnia. In the midst of a three-way civil war between Bosnian Croats, Bosnian Serbs, and Bosniak Muslims, five French aid workers attached to the NGO Le Tete d’Or set out to deliver clothing and food to war-weary women and children. The official story is clear—a group of ethnically mixed families are holed up in a mine with very little provisions. Outside of the wire, Croatian paramilitaries guard their zone against Serb and Muslim attacks. The French humanitarians have volunteered to deliver aid to these trapped civilians. The only thing standing in their way are the various checkpoints manned by paramilitaries and professional armies. A motley assortment of characters sit in the two rickety trucks. In one is Maud, an intentionally asexual and naive young woman who balks about the very thought of romantic love; a pathetic apparatchik named Lionel; and a suspicious former radical named Vauthier. In the other vehicle are two former soldiers, Alex and Marc. Despite their supposed unity of cause, each figure is working for their own end: Lionel wants Maud, Maud has some idealistic idea about delivering aid, Alex wants to find a lost love among the refugees, Marc wants to help win the war, and Vauthier wants to stop Marc. Amid this private intrigue, other forces, from the UN to intelligence agencies, play backstage roles that deeply impact the novel’s action. At its core, Checkpoint asks many profound questions about the nature of humanitarian aid. Should providing nonviolent aid be the sole purpose of NGOs in wartime, or is sending arms sometimes the must peaceful thing that can be done? Going further, Rufin urges his readers to consider the true ramifications of war in the name of humanitarian aid. 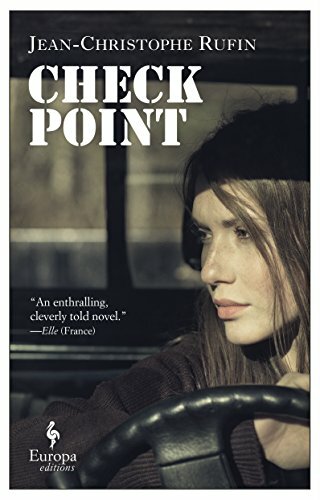 While Checkpoint takes place in the far-off and the somewhat comforting battlefields of mid-1990s Bosnia, its message is applicable to the modern conflicts of Syria, Yemen, and Afghanistan. As much as Checkpoint attempts to show the futility of picking sides in a civil war, Rufin cannot help but drop in historical bad guys. One villain who shows up is Zeljko Raznatovic, a Serb paramilitary leader better known as Arkan. Without bluntly saying it, the responsibility for the book’s one massacre scene is placed at the feet of Arkan’s Serbian Volunteer Guard. By the novel’s end, the author’s political opinions are somewhat clear, even if the characters themselves don’t see it. As a philosophical novel, Checkpoint is very engaging. As a thriller, Checkpoint suffers from prolonged dry spells where nothing of importance happens. However, once the long suspected tensions boil over, Rufin does a good job playing catch-up. Gun battles, explosions, and fights all appear after the first one hundred pages. Ultimately, this bloodletting is not the appeal of this book. Checkpoint is about the nature of modern warfare and the various definitions of humanitarianism. Benjamin Welton is a freelance writer, music critic, author of fiction and poetry whose work has appeared in such publications as Crime magazine, Aberrant Labyrinth, Vermont's Seven Days newspaper, Vantage Point, The Weekly Standard, and others.